View More In Foot Switches. This Linemaster 936-SWHOX Atlas 3 amp 240V/6 amp 125V foot switch has an aluminum treadle, oversized housing, and a waterproof conduit entry suitable for use in applications in potentially wet environments where users need hands-free, on-and-off power activation. The foot switch provides single-stage, momentary operation for quick-release termination with a sensitive, snap-action switch for light-force operation. It has an aluminum treadle and housing for durability and protection from corrosion, and the oversized cast aluminum housing accepts large-size safety shoes and metatarsal foot guards. Bolt holes are provided for mounting to the floor or equipment The switch has a Panzer-Gewinde (PG) 16 threaded waterproof conduit entry for wiring. 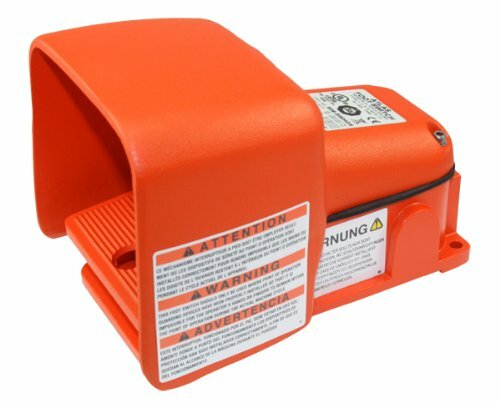 This foot switch meets Canadian and United States Underwriters Laboratories (UL) standards for quality assurance and meets European Conformity (CE) product compliance safety standards. It has an Ingress Protection (IP) rating of 68 for total dust ingress protection and permanent submersion in water, an International Electrotechnical Commission (IEC) rating of 601-2-2 for the safety of high-frequency medical electrical equipment, and is compliant with the Restriction of Hazardous Substances (RoHS) directive. This momentary operation foot switch is suitable for medium-duty applications such as power tools, surgical equipment, and others. If you have any questions about this product by Linemaster, contact us by completing and submitting the form below. If you are looking for a specif part number, please include it with your message.